This was going to be my girlfriend’s first long trip on the motorbike, or for that matter, her very first trip on a motorbike, and crossing Europe from north to south was quite a bit like throwing her at the deep end of the pool with no warning. It was going to be a make or break trip, so I was hoping for good weather, even though I was not exactly optimistic about the dark clouds we had seen the day before. Sure enough, as we rode out of the hostel and into heavy traffic, it started to rain. There was a huge traffic jam on the way to the ferry terminal, and what had to be a ten-minute ride was taking so long that I was afraid we would miss the ferry. If I had been in Russia, I would just have ridden onto the pavement and to hell with it, but we were in law-abiding Finland and there was no space to filter between cars, so I just had to inch forward patiently just like everybody else. 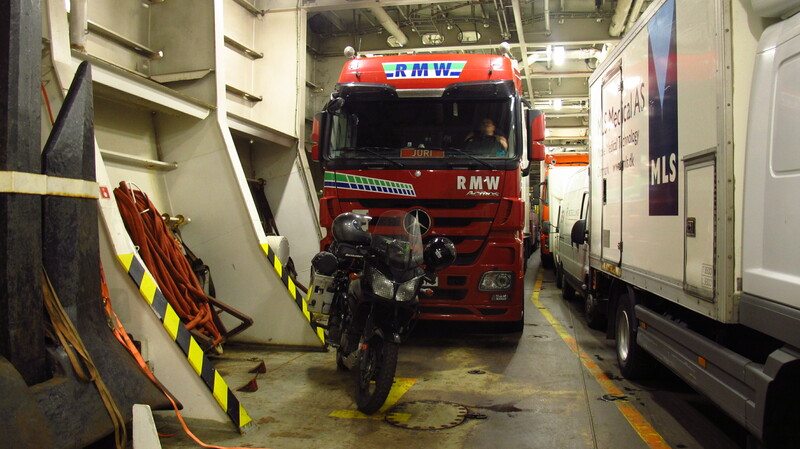 In the end we made it to the terminal just in time to board and park the bike in front of a lorry. The rain was getting heavier and this crossing was on open sea, unlike the one from Stockholm, so I asked for some straps and tied the bike down just in case. By the time we got to the top deck and the ferry was leaving, the rain was pouring down and there was a gale force wind. Fortunately, this ship had a bigger covered area on the top deck, so we were sheltered from the rain despite not having a cabin. 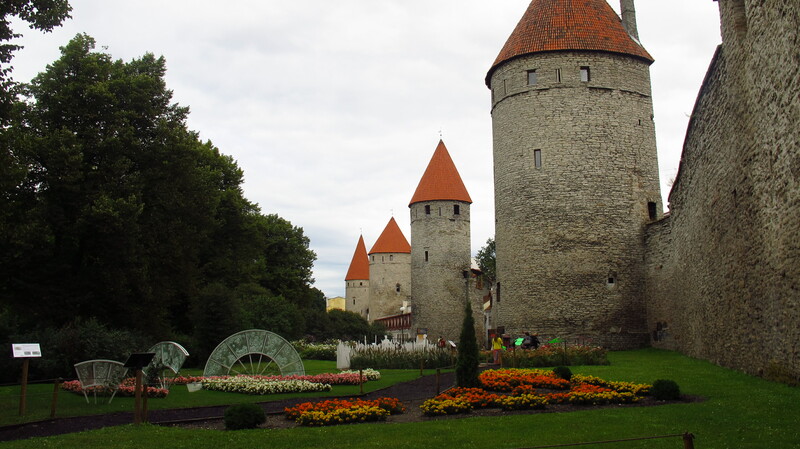 In less than three hours we were riding off the ferry in lighter rain and quickly found the hostel in Tallinn, right in front of one of the gates in the old town walls.There was parking space right on the door, and as it was just the bike, they did not charge us for it. We dropped our bags and just as the rain had stopped, went to explore the old town. Unlike other European cities which are popular tourist destinations, I did not know anybody who had been here before, so I did not know what to expect of the city nor the country. Being an ex-soviet republic, I was expecting something quite gray, Russian-style, but it turned out to be a beautiful, city – the old town was charming, narrow winding medieval streets on a hill with views to a nice, modern, taken care of city. 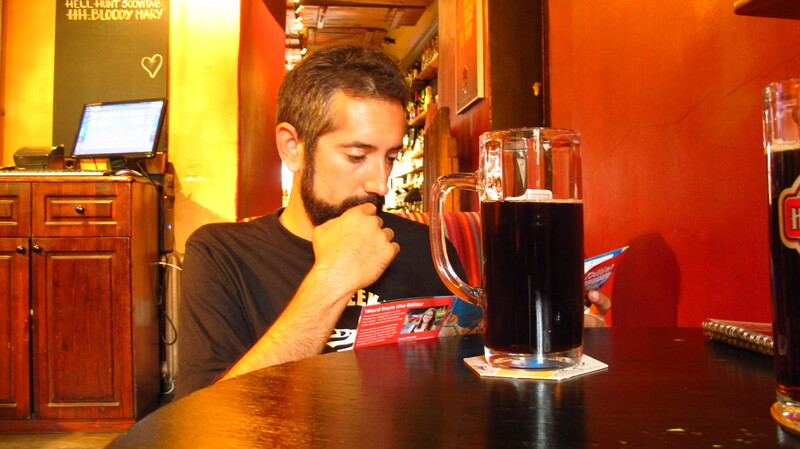 We spent the afternoon walking around and then headed for a pub to have a pint of the local black beer, which was delicious. Before going back to the hostel, we did some shopping (including superglue to repair my sandals) and then looked for a cheap place to have dinner out. This was a luxury I had not been able to afford since Russia, since prices in Scandinavian countries were ridiculously high, so it was a pleasure to find a cozy place where we had dumplings, salad, chicken Kiev, a pint of beer and dessert for 7€. I love Eastern Europe. 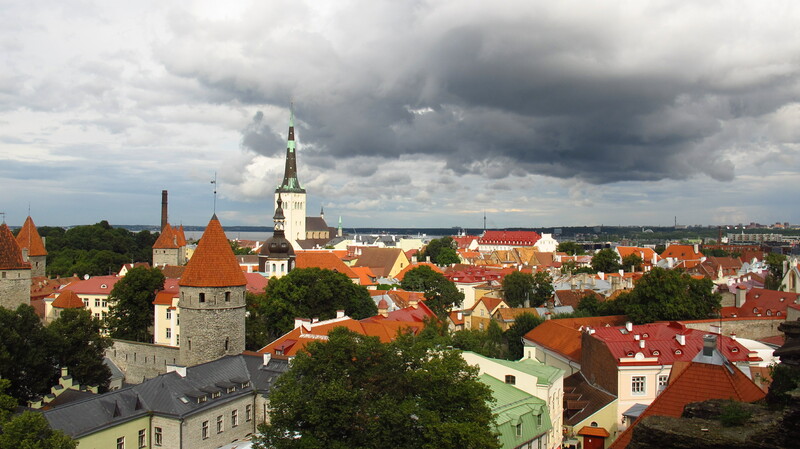 This entry was posted in Stroming The World 2013, Travel and tagged ferry, Helsinki, rain, Tallinn by Kilian. Bookmark the permalink.